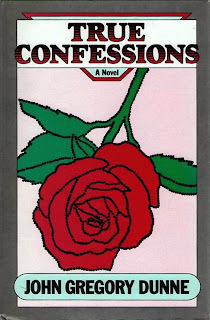 True Confessions reads like an epic poem written in the free-verse rhythm of voices resurrected from the golden age and golden land of noir, which of course would be post-World War II Los Angeles. 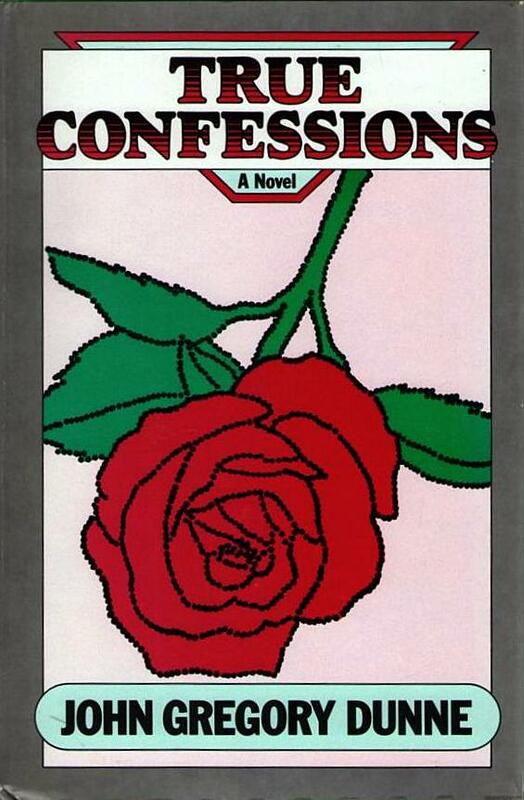 Most novels in this overstuffed pigeonhole follow a gritty, one-dimensional formula, but True Confessions, written by John Gregory Dunne and published in 1977, is infused with fresh breath and a brogans-on-the-ground sense of reality. In its pages, Dunne was able to create a world guided by chance and fate that holds together better than the stories of even the most accomplished liars, and with none of the fatuous coincidence and myopic plotting that would cause a lesser writer to scramble for spurious explanations further into the book. Obviously a tribute to the genre, True Confessions is not obsequious, imitative, or slobbering. A nice long kiss on the mouth but with too much class for tongue, True Confessions says, “I love you,” without any meretricious groping. As a work of art it takes its place in a long literary tradition of crime novels where the only new ground broken is originality of voice and the adroitly and distinctively depicted confluence of character, motive, and circumstance. Inspired by Los Angeles’ infamous 1947 Black Dahlia murder, the plot of True Confessions is fairly straightforward. The Spellacy brothers, Des the priest and Tom the cop, are on their own separate journeys to power and truth. But when the bisected body of Lois Fazenda, a hopeful Hollywood nobody, is found in a dingy L.A. neighborhood, a chain of events is set off that brings down just about everyone who ever laid eyes on her. Des is a monsignor in the L.A. archdiocese and a comer. The Cardinal’s right-hand man, he’s being groomed for a bishopric and the keys to the archdiocese. A “combination lightning rod, hatchet man, and accountant,” Des is a street-smart priest who understands that “the calibration of sin was the essential element of his trade.” This comes in handy in the confessional, but it is indispensable in ministering to the wheeling-and-dealing ways of the archdiocese and how it operates behind the scenes, especially when it comes to sharpies with whom it sometimes reluctantly conducts business. Brother Tom Spellacy is a homicide detective with an attitude problem, and it’s difficult to blame the guy. His children have joined religious orders and his wife has committed herself to a mental institution. He met his current girlfriend, Corinne, when a three-time loser named Turd Turner took her hostage and Tom had to rescue her. Nothing if not a stand-up guy, as a thank-you to Turd, Tom walked him to the gas chamber. The archdiocese is in a hurry to sever itself from Jack Amsterdam, a crooked businessman and parishioner who greedily allows those two roles to mix. When Tom traces the trail of Fazenda, known to newspaper readers after her death as “The Virgin Tramp,” it leads to Amsterdam, archdiocese legal counsel Dan T. Campion and, unfortunately, brother Des. While none of them are even remotely involved in the murder, the crime is so toxic that the careers of anyone close to it are condemned. Also in play is the career of Homicide Division Captain Fred Fuqua, who’s bucking for promotion to chief and is a constant irritation to Spellacy. Spellacy’s solving this high-profile crime would certainly help Fuqua’s aspirations, but so would playing ball with the lay Catholic hierarchy who happen to run the search committee. But Tom’s honesty (or his anger) is pathological. He welcomes the opportunity to associate Amsterdam, Campion, and his own sibling, Des, with the taint of the crime just to settle an old score--even though Des and Amsterdam were influential in helping Tom keep his job after the LAPD underwent an enormous graft scandal. Less a breath of fresh air than an odious blast from the bowels of iniquity is Tom’s detective partner, Frank Crotty. The one character here with no pretense or illusions about the homicide-solving business, Crotty spends as much of the department’s time going through the motions of solving crimes as he does furthering his own business interests with shady partners. Ever on the lookout for opportunities, he buys his white linen suits from movie studio wardrobe departments after noir actor Sydney Greenstreet is finished wearing them in his roles, and sells the story of “The Virgin Tramp” to a film studio before the ink is even dry on the police reports. In crime novels, information is everything: who knew what when, how it’s disseminated and then pieced together, and in True Confessions all this is done with brilliance. The flow of the narrative, at times garrulous, gossipy, inventive, deadpan and above all ironic, disperses information in a manner that allows Tom Spellacy to act on it and close the narrative net until it captures the truth--which in the nihilistic world of jaded police and clergymen doesn’t do anyone a bit of good. True Confessions is a novel that even the least sensitive readers can feel vibrate in their hands. Not the leaden dirge of a hack mourning a genre, it’s the dynamic song of an artist taking the mundane and giving it life. READ MORE: “The Book You Have to Read: The Other Girl, by Theodora Keogh,” by Steven Powell (The Rap Sheet). A true masterpiece. The movie version isn't quite as good but is true to the book in many respects and has some of its own powerful truths about Catholic Church politics to impart. Something confessional in the air these days...S.J. Rozan writes about TRUE CONFESSIONS in BOOKS TO DIE FOR (edited by John Connolly and Declan Burke). Which proves that---sometimes, at least---good books eventually get their due.